Rieth Village was created to house Goshen College’s expanding environmental science program and to enable students to live near the ecosystems they study at Merry Lea, the college’s 1,189-acre nature preserve. Rieth Village serves as an ecological field station that includes two residential cottages, and a third cottage which serves as a classroom and office building. All three buildings were conceived and designed to meet the highest standards of the U.S. Green Building Council’s LEED (Leadership in Energy and Environmental Design) rating system. LEED buildings are required to earn points on a rigorous scale that covers areas such as energy efficiency, water management, use of recycled materials and indoor air quality. Rieth Village was the first building project in Indiana to earn LEED platinum certification. Rieth Village was created to house a variety of programs that operate within Merry Lea’s educational mission. These include PreK-12 educational programming, Goshen College’s undergraduate agroecology program, and a variety of public programs offered to visitors, educators, and community members. 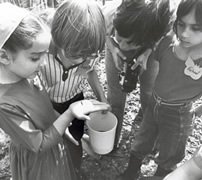 In addition, the construction of Rieth Village helped facilitate the development of Merry Lea’s graduate program in Environmental Education, which is centered at Merry Lea’s Learning Center, one of many other facilities at Merry Lea’s 1,189-acre nature preserve. In addition to an immersion in ecosystem studies, the buildings themselves act as learning tools for the students during their residential experience at Rieth Village. During their stay, students monitor their own energy usage, learn how water they use is purified by wetland plants, discover the benefits of ground source heat pumps, and explore other energy-saving and innovative features of Rieth Village. Living in sustainable buildings is an important part of the interdisciplinary and experiential design of the educational programs offered to Goshen College’s undergraduate students.